The eastern part of South America is close to the equator, so it has been hot and rainy for a long time. The special climatic environment has brought huge wealth to the local people, including high coverage forest, abundant hydropower resources and abundant mineral resources, including iron ore, oil and gold. In the middle of this month, we received a visitor from South America, who hoped to find a suitable material for mineral exploration in the middle of 2017. Mineral exploitation is a very dangerous job. When workers work at a large scale, the loss of tooling will be higher than that of other industries, and often faces harsh working conditions such as high temperature, dark and humid in mines. So a flame retardant ripstop coverall with a reflective belt is the most suitable choice. 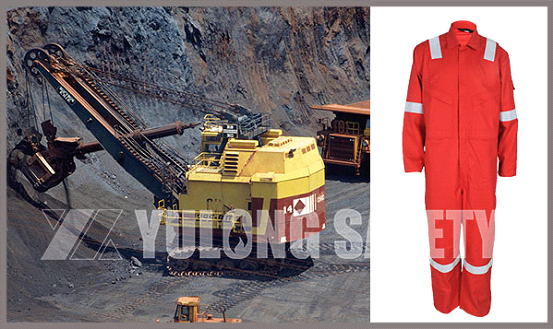 Recommend light weight flame retardant ripstop coverall of our sales staff according to the local climate and the nature of the work of the mining industry for the guest, the fabric in warp and weft are added with anti tearing fiber, so no flame retardant properties on fabric in garment for longer time and influence. The designer of our garment factory has designed a more concise and comfortable fit for our guests according to the characteristics of the mining work. It also adds reflective tape to the main parts of the garment, so that even in a dark environment, the staff can easily see their partner's position. Our guests were very satisfied with the tearing resistant and flame-retardant conjoined, and signed the order of the year. Xinxiang Yulong Textile Co., Ltd. specializes in production of protective fabrics and protective clothing. And the company's protective fabric factory and industrial protective clothing factory integration, forming an integrated production line. From raw materials to finished products, there are professional quality inspectors in every link of production to ensure the quality of products. The integrated production mode greatly reduces the production time of products, and saves more funds for customers while ensuring delivery time. Xinxiang Yulong Textile Co., Ltd., leader of flame retardant fabric and flame retardant clothing industry.